It’s officially spring and that can only mean two things. First, it’s also officially spring cleaning time. Second (and decidedly more fun), Spring Break is coming! Whether the idea of cleaning, sprucing and organizing fills you with glee or with dread – I’ve got an awesome offering today to help you get it done quickly AND to enjoy all the extra free time with the kids. We’re offering a limited time, “Save Your Spring” Bundle on our most popular PDF products. The deal will not be available again for another 12 months! The Camp Mom Activities Pack PDF – An 84 page PDF perfect for keeping the kids busy over spring and summer breaks! 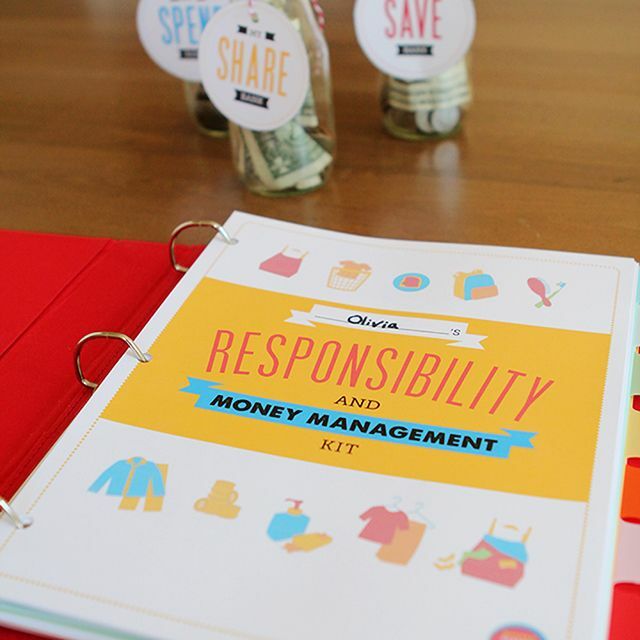 The Kids’ Responsibilities & Money Management Printables Pack – routine charts, chore charts, allowance ledgers and more to teach your kids all about the benefits of autonomy, family contribution, money smarts, and a giving heart! These kits are just what you need to finally get organized and have some fun this spring! I’ve sold thousands of these printables to overwhelmed parents and I’ve heard from so many of them that they really are making a difference in their day-to-day experiences with their kids. Loving my printables. Absolutely perfect. Job well done!!!! Awesome job! I’ve already pinned and I’m definitely buying. Our 2017 daily/weekly/monthly planners, cleaning schedules, meal planners, kids’ routine charts, budgeting sheets and more are all designed with you in mind. They’ll help both you and your kids get organized and even introduce the kiddos to important money management concepts including saving, budgeting, and giving back. We know how busy you are. The goal of all of these printables is not to have to learn a whole new system but simply to help you streamline your everyday tasks. If we can do it with some cheerful colors and pretty fonts – then that’s just icing on the cake. All that and with the Camp Mom Activities Pack you’ll already have your Spring Break activities with the kids planned too! I’m SO excited to unveil a whole new printables pack that will help you give your kids the gifts of autonomy, family contribution, money smarts, and a giving heart. I wanted to make sure this printables pack was extremely flexible and could be used by family‘s practicing all types of chore and responsibility systems in the home. In our house, we have a list of family jobs as well as a list of extra money jobs. Again, you can approach money jobs in a variety of ways. The worksheet contains a spot for the job as well as a spot for it’s value (watering the plants earns our kids less than weeding and raking leaves).Each child can have their own Money Jobs sheet or they can all work off one common list. To give you an example of how we’re currently using these banks – the Spend Bank has been used for small purchases such as a $.99 app or an ice cream from the neighborhood ice cream truck. It’s also being used to save up for a $20 LEGO set. The Save Bank is money that will be contributed towards a family trip to Disney Land and the Share Bank will be used to buy some school supplies for local foster kids. Helpful Hint: The banks and goal sheets can be awesome catalysts for getting the kids to work together and share. Once my 4 and 5-year-old saw how long it was going to take for big brother to save for the LEGO set, little sister decided they should pool their money since she’d likely want to play with it too. Similarly, my friend’s daughter recently used some of her “Share” money to buy her little brother an ice cream cone when he didn’t have enough money of his own. What’s on your spring break and summer vacation bucket lists this year? How about the simple goal of entertaining the kids with some good ‘ol fashion at-home fun? Sounds like a good plan, right? Activities that will allow for bonding time, but also independent play, and that will keep the kids happy and their brains stimulated all spring and summer long. Four themes with over 45 Simple and FUN activity ideas that are open-ended and perfect for kids aged 2 – 9 plus tons of bonus ideas. Adventure ideas and tips – you can have adventures without leaving your backyard or use the ideas to get out and explore your community. Tips for success: managing sibling conflict, what to do with the toddler, how to enjoy a museum with your kids, and etc. Reading recommendations to go with each of the 4 themes. PLUS – Sensory Play Any Day theme with a printable list of ideas you can refer to any time you need an activity QUICK that will engage the kids and keep everyone happy. The Sensory Play section also includes links to loads of sensory activities that rank as favorites with our kids. In total the pack contains 45 detailed play activities as well as TONS more ideas and resources. It’s basically what you’d get if you asked all of your favorite teachers, babysitters, and supermoms to make a summer curriculum just for you. It’s that time of year again, when we all take a deep breath and vow to make a fresh start. And to help you out, we’ve got some big, exciting news to share today! When we launched our handbook to leading a more simplified life, Project Organize Your ENTIRE Life: The Quick Start Guide. It was a huge success and we’ve since sold well over 10,000 copies. But I also heard from you guys that you would like some handy-dandy printables to go along with your newly-formed action plans. So I worked really hard to make that wish a reality. Inside our 38-page printables pack, you’ll find everything you need to manage every aspect of your day-to-day life from cleaning and meal-planning, to scheduling and that never ending to-do list. There’s something for everyone here including two different cleaning systems (are you more of a checklist person or a calendar cleaner?) as well as all the printables in both an 8.5″ x 11″ size AND a 5.5″ x 8.5” size. So whether you’re looking to create a home management binder, want to use these in your personal planner you carry around in your bag, or just want a meal plan/to-do list/cleaning chart to stick on the fridge – we’ve got you covered! There are tons of options in this 38-page printable pack – use them all or pick and choose exactly what you need. There’s even a suggested daily cleaning checklist, weekly cleaning schedule, and master cleaning list included. A simple one-page form that breaks your day up into easily manageable chunks. There are check-off boxes (for that sense of satisfaction when you complete a task) as well as designated areas for the day’s menu ideas and appointments. This one is a great candidate for laminating and using over and over with a fine-tip dry erase marker. Conveniently spread across two vertical pages, this gives you a spot to record all of your appointments for the week along with any special reminders you need to leave for yourself in the “notes” section. There are also spots for your dinner plans and cleaning objectives for each day. It’s everything you want to accomplish in your week all in one spot. Designed to help you quickly and efficiently get your weekly meal planning done. Includes sections for all 7 days of the week as well as areas for breakfast, lunch, and snack ideas so nothing gets overlooked. Keep it in your planner or stick it on the fridge for a visual reminder each morning of what needs to be prepped for that night’s dinner. 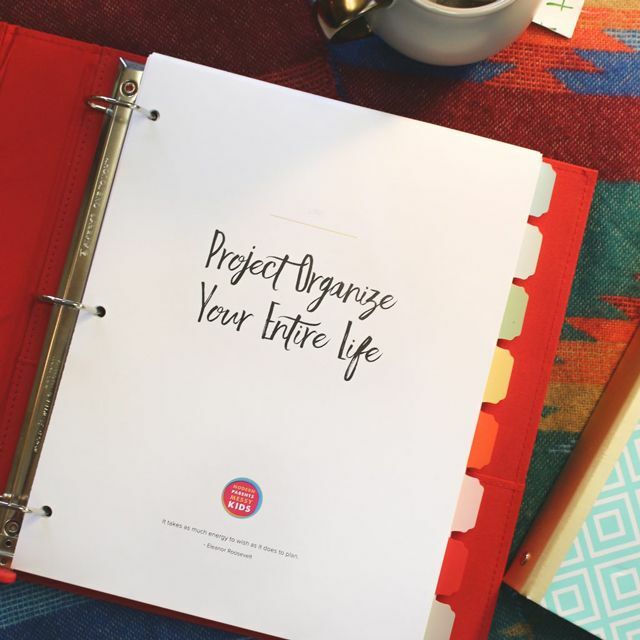 In the Project Organize Your ENTIRE Life eBook, we cover two different types of cleaning systems for two different types of people: the cleaning schedule vs. the cleaning checklist. In this printable pack, we’ve provided both so you can try each out and see which suits you best. Much like the Weekly Meal Planning Worksheet, the cleaning schedule visually lays out everything you need to accomplish for the week to keep your house looking good. Assign one major task or room of your house to each day of the week and complete with your daily and infrequent tasks (drawn from the master cleaning checklist). While still including sections for daily and infrequent tasks, this option breaks down all of the cleaning tasks for the week into those that will take 15 minutes, 30 minutes, 45 – 60 minutes, or 1 hour or more. The idea being that whenever you find yourself with a little time to clean, you can quickly check the list for what hasn’t been done yet that week and get to work. *Printing Note: Since you won’t need both the “Weekly Cleaning” worksheet and the “Weekly Cleaning Checklist” – the intention is to choose one or the other and this must be done for double-sided printing to turn out correctly. When printing, in the pages box, either enter “1 – 6, 8 – 38” OR “1 – 5, 7 – 38”. Along with the blank worksheets, you’ll also get versions of both the Weekly Cleaning Schedule and Checklist filled-in with suggested chores for each section. Along with squaring away your everyday and your week, it’s always helpful to get a look at your month as well so we’ve included pre-dated calendars all of 2017. Like the weekly calendar, these are spread out over two vertical pages (no turning to view required). Whew! That was a lot- glad you’re still with me! As you can see, there is a TON of value packed into this special bundle. I really hope you take advantage of this once-a-year sale to get your printables and have a great spring with the kids too! !